Content created by students in the 2016 INSIGHT High School Program at HIPRC. Learn about HIPRC’s traumatic brain injury research. Myth: I'm young, so I can recover from a concussion faster than an adult. Myth: I’ve already had one concussion and it wasn’t THAT bad, so why should I worry about another? Reality: Sustaining a second concussion while recovering from your first is actually very dangerous, because it can lead to rapid brain swelling. Therefore, if you suspect you may have a concussion, you should remove yourself from play and visit your physician. It is also important to remember that studies have shown that repeated concussions can result in neurodegenerative diseases (Molecular and Cellular Neuroscience – Journal). Myth: Because I wear a helmet in my sport, I can’t get a concussion. Reality: While helmets can help mitigate the chance of a concussion via direct impact, they do not completely prevent against it and certainly do not prevent concussions that are a result of a change in momentum that causes your brain to hit against your skull (whiplash) (American Medical Society). It should also be noted that you can get a concussion in other day to day activities such as driving, not just sports. Myth: I might have a concussion, but luckily it only takes a few days to recover. Reality: For the average youth, it will take 10-14 days for concussion symptoms to dissipate, but this does not mean your brain is fully healed. A recent study found that the brain could take longer than three months to heal after a concussion (Neurology – Journal). It should also be noted that about 15% of people with concussions experience something called post-concussion syndrome, where their symptoms can linger for a year or longer. 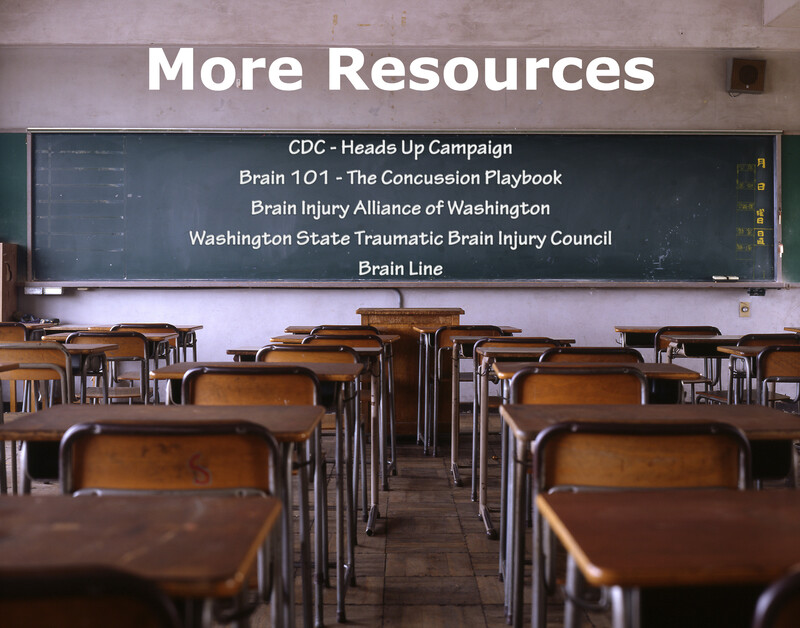 Myth: I should sit out of sports after a concussion, but there is no reason to miss school. Reality: If you sustain a concussion you should visit a doctor as soon as possible to find out what is best for your unique circumstances and injury. Until instructed otherwise by your doctor it is important to remove yourself from all activities, including school. You may have heard of the ‘Return to Play’ (CDC) protocol that outlines the steps to take before returning fully to your sport but there is also a less know ‘Return to Learn’ (CDC) protocol that must be completed before you should even begin to ‘Return to Play’ (CDC). Myth: Concussions should always be treated the same way. Myth: I bumped my head pretty hard, but I feel fine, so I’m sure I don’t have a concussion. Myth: My brain will eventually fully recover from a concussion. Myth: I didn’t hit my head, so I can’t have a concussion. Reality: It is possible to sustain a concussion without a direct impact to your head. This is because your brain is essentially ‘floating’ in your skull meaning that any type of movement (such as whiplash) can cause your brain to hit against your skull resulting in a concussion (CDC). In fact a recent study has show that it is even possible to get a concussion while head-banging at a rock concert (The Lancet – Journal). Myth: It’s okay to drive with a concussion. Reality: If you suspect that you may have a concussion you should not drive. Ask somebody close to you to take you to your doctor who will give you further instructions on your recovery and when you can get behind the wheel again. You run the risk of causing harm to yourself and others if you drive without clearance from a doctor. (Brain Injury – Journal). If you expierence any of these symptoms please see your physician as soon as possible. I might have a concussion. Now what? When in doubt just sit out! Report it: Completely remove yourself from all activity and notify your parents, teachers, friends and coach. Visit a Doctor: Have a close friend or family member take you to see your physician right way. They will either diagnose you with a concussion or not and inform you on how to proceed. Between 2001 and 2009 the rate of emergency department visits for traumatic brain injury increased by 57%. Let’s change that. (CDC).